If your travels take you to Portsmouth on the south coast of England, you will easily find a vast museum area to explore – the Portsmouth Historic Dockyard, where ships from different time periods are on display. This includes the famous Mary Rose, which, according to Henry VIII’s admiral Sir Edward Howard, was ‘the flower of all the ships that ever saild’. 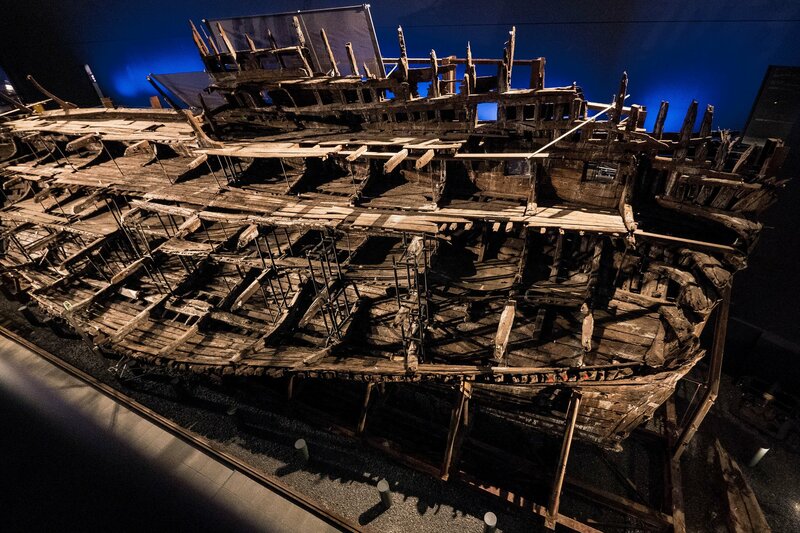 The Mary Rose, known as Henry III’s flagship, sank in the Battle of the Solent in 1545, when Henry’s fleet fought against the fleet of Francis I of France. Before that, Mary Rose had a successful career of 34 years, taking part in all three French wars and in both major naval engagements during Henry VIII’s reign: The Battles of Brest and of the Solent, though, apparently, the Mary Rose did not make it to see the end of the second battle. It is a common mistake to believe that the Mary Rose sank on her maiden voyage – that would be the case of the Swedish Vasa, a royal warship that was so ill-designed that she did not even make it beyond Stockholm harbour; and that would be a story for another day. The Mary Rose was as successful as high-ranked for a warship: not only that she had been service for over three decades, but she also witnessed a lot of important events in English and French history. For instance, the Mary Rose is the very ship that escorted Henry to the Field of Cloth of Gold to sign peace with Francis, after which she was laid up. But as soon as the horn of war was sounded, the Mary Rose took up her post. Precisely why the ship sank remains a mystery. Most accounts about the events are dated much later than 1545. The only contemporary – therefore, more trustworthy – account comes from a survivor, recorded by Emperor Charles V’s ambassador; according to him, the Mary Rose’s sinking was caused by gunports that were left open by neglect. The ship was turning to allow the guns on the other side to fire, but water flowed in through the opened gunports and flooded her, which eventually led to the tragedy. Although this may have been what happened, a number of reasons have also been brought up: the cousin of Sir George Carew, Henry’s vice admiral and captain of the Mary Rose, claims that it is because the men disobey or ignore Carew’s orders; a French soldier claims that the ship sank because she was gunned down by the French fleet. It could also have been the wind, the weather, or the fact that the Mary Rose was simply overloaded with heavy artillery – an inventory of 1514 records that she has 78 guns and many other weapons. The Mary Rose as depicted in the Anthony Roll. The distinct carrack profile with high “castles” fore and aft can clearly be seen. Although the number of guns and gun ports is not entirely accurate, the picture is overall an accurate illustration of the ship. Several attempts have been made to salvage the ship. The first ones were made not long after the battle. A report in August 1545 claims that the Mary Rose will be lifted up and saved ‘by Monday or Tuesday’, but apparently the rescue ended in failure. In 1836, the brothers John and Charles Deane, pioneers of diving engineering, located the shipwreck and left records of its location. But as the Deane brothers had to leave the work behind and as time passed on, the location of the Mary Rose has been gradually forgotten, until Alexander McKee, diver and military historian, took up the job in 1969. Today the remnants of the Mary Rose lie in the Mary Rose Museum in Portsmouth, which was opened in 2013 but was not entirely dried until 2017. With the help of modern techniques, the Museum enables to bring to life the artefacts excavated from the Mary Rose, the ‘time capsule’ of the Tudor Era. Here are a few of the objects that are put on display; together, they give us a glimpse of different aspects of the life onboard. The bell was rung every half hour to mark the passage of time – though numerous sundials and other time-telling devices have been found onboard, this bell announces time to the entire crew. It would not be exaggerating to say that, if the ship is a small town, this bell amounts to its church belfry. The inscriptions on the bell read ‘IC BEN GHEGOTEN IAER MCCCCCX’, which is ‘I have been made in the year 1510’ in Flemish. It is probably as old as the ship herself. You can find a 3D model of the bell on Sketchfab. If you look closely you’ll find a rose carving on the bell – a four-petaled one, however. Is it not meant to be a Tudor Rose, or is it a mistake? This key-like wooden sculpture was once proudly installed at the front of the Mary Rose – yes, this is her figurehead, which was found during the excavation period of 2003 to 2005 and was put on display in July 2016. Experts have digitally restored the Tudor Rose emblem that has been depicted in various images of the Mary Rose. Unfortunately, only the starboard half of the Mary Rose (minus the high castle) has survived, thanks to the silts which buried this part of the ship and thus preserved it; the rest has been eaten away by current, erosion, and sea creatures. It is also on this side that the ship sank. The new museum at the Historic Dockyard allows a full view of the ship’s structure; with the help of projections, we can even tell what each cabin was used for and who used to occupy these rooms. Anti-boarding netting, as its name suggest, was used to make it harder for the enemies to board the ship: back then, the priority was not to sink the ship but to capture it; and the netting would help to prevent exactly that. Though only fragments, what is in the picture is the largest surviving pieces of the netting, originally installed above the open upper decks of the ship. Considering the Mary Rose’s successful career, these ropes must have done an efficient job to keep the enemies at bay, but, unfortunately, they also minimized the crew’s chance of escape. These fine plates, knife, and tankard once belonged to the Master Carpenter of the Mary Rose, who apparently earned much more pay than ordinary crew members. The Master Carpenter is important to any ship, for it is his job to keep it in good shape. The tankard is the only known 16th-century specimen with those intricate patterns. The dog was found just outside the Master Carpenter’s cabin (which, by the way, has a slide door). He would be the mouser of the Mary Rose. Based on the dog’s DNA exacted from one of his teeth, he has been identified as a male dog between 1.5 and 2.5 years old. Although it is impossible to pinpoint which breed, he is most likely a terrier-type. The cook is one of the very few people who can be identified on the Mary Rose, because he carved his name into his some of his utensils. One of them is this wooden bowl, on which you can just make out the letters ‘Ny Cop’ or ‘Ny Coep’; cross-reference with other carved items suggests that this is the cook’s name. Around the bowl you can see a few tools and personal items of the cook. The traces on the stool indicate that it has been used as a cutting board. This beautiful golden coin was found in a money-changer’s purse, which consists of a few of pouches for different currencies or different coins. Dating back to the reign of Edward IV, this coin, called ryal or noble, was the oldest coin recovered from the Mary Rose. The inscription reads IHC AUTEM TRANSIENS PER MEDIUM ILLOR IBAT, ‘Jesus however, passing through them, went away’.